When it comes to finding the career track which is best for you, there are a number of physical therapy career options. Not all physical therapists are in the clinic. 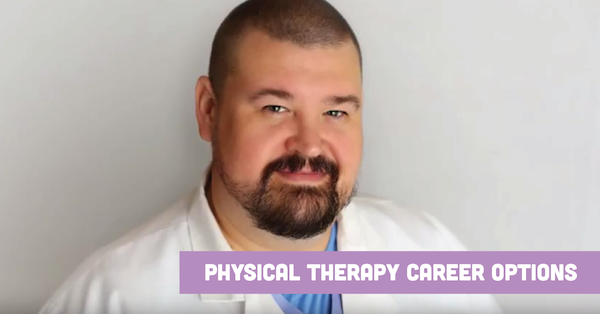 We decided to chat with Scott Feil, supervising physical therapist at Nova Medical Centers, about his career and the various job options available for physical therapists looking to branch out of the clinic. Feil has been a physical therapist for eleven years and describes himself as “a journeyman - I’ve done it all.” Feil lists travel, home health, acute care and outpatient as some of the jobs he’s worked over the years, and he is currently working in worker’s compensation. “Any setting can be ideal if you make it what you can make it,” he says. One of the biggest lessons Feil took from his years in school is to use every opportunity as a learning opportunity. “Get your hands dirty, get your feet wet and try things out,” he suggests. When it comes to earning a PhD or another terminal degree in physical therapy, Feil has a few warnings. Since a PhD is a huge commitment which takes a lot of time, effort and money, you shouldn’t take one on unless you’re absolutely sure that it’s the right choice for you. Since most PhDs go into teaching, you should ask yourself whether academia or education is the right place for you. If teaching seems like it might be right for you, but you’re still on the fence, Feil has a few suggestions. You can offer to guest lecture at a local career, and if that feels right, you can take on some work as an adjunct instructor. There are plenty of other avenues in education which don’t get as much attention, such as teaching CU courses, getting into clinical education or taking on a fellowship residency.